How long would you bake this in the oven, maybe 30 minutes in a water bath? Two minutes? Get out of town. That's my kind of cooking. I love this cause you don't have to make a whole kitchen mess rolling out pie crust and all that jazz! I just bought some canned pumpkin to make some dishes and I definitely will be making this in a bit! 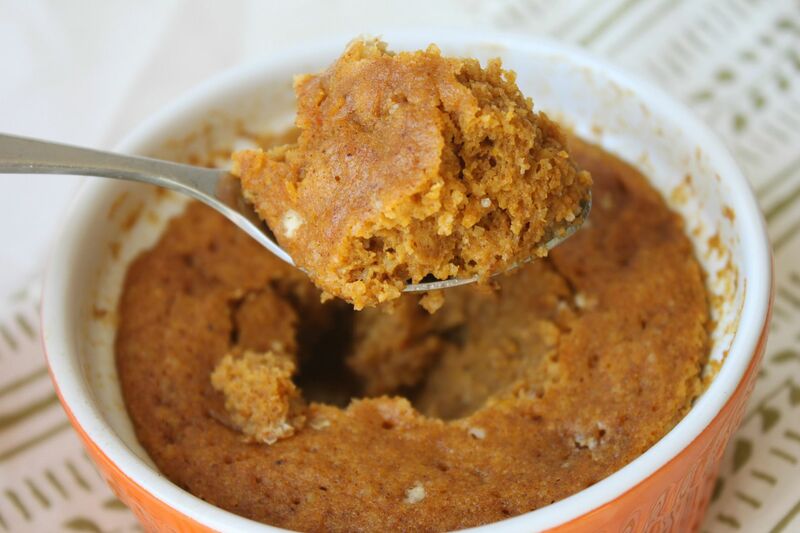 I tried this with my coconut flour muffin in a mug and didn't get the full pumpkin effect. I will definitely be trying this recipe since you already figured out the measurements for me! Oh man. That sounds insanely good. I am most definitely going to try it. Oh my god...this looks amazing. minus the microwave part since i'm terrified of them and don't own one. LOL! I made cookies for some friends of my hubby's that helped us move and they told me they were "hella dank." I had to ask what it meant. I'm officially old. PS - another useful term? "Pythons". Apparently pythons are the new "guns". PPS - This recipe is going to be DANGER in our house! :D Yum! I love this! I have just been getting into the microwave cakes because I have a microwave now...So handy and tasty when you want dessert NOW. has anyone tried this in an oven? I cannot use a microwave!! Yum! looks easy and I just love pumpkin! I've been waiting for you to post this!! Sounds great! And Dank also means thanks in Dutch! I should know, I'm Dutch! Ha! Looks delicious! I love the quick and easy recipes! I am really going to have to try this. I have had a hard time using almond meal for paleo recipes...hopefully, this will work! You baked it for only 2 minutes? Wow, that's amazing! Couldn't wait to try and bake this for my family. I also love the fact that you used coconut oil instead of other types of oil for this recipe. This is so good! I'm eating it for breakfast right now. I added a dab of butter to the top. Thanks for the recipe inspiration to keep us on track through the crazy fall dessert season! I'm a huge fan of the chocolate mug cake! I've made it several times already since discovering it on Sunday! Two batches went to my dad for his birthday (I threw in some mini chocolate chips and sliced the cakes after I cooked them so they were kinda like brownies). So much easier than baking an entire cake :) So, today I was wondering if there was a way to make it vanilla, so instead of the cocoa powder, i subbed 3 tbsp of unsweetened shredded coconut. I guess it tasted a little more coconut than vanilla, but it worked for me! I can't wait to try the pumpkin pie!!! If using coconut flour would u use three tbsps still? I was thinking less since it is so absorbent?? This will be what I make myself for thanksgiving, thank you! I'm newly diagnosed type 2, so I'm really trying the paleo way to control rather than ADA diet. I'm worried about the tablespoon of honey - do you feel it affects your blood sugar much? Does anyone know the net carbs for this delish cup of yum! can anyone tell me how much calories is in this? You can freeze the extra pumpkin too. I don't have a microwave, can I bake this? How long? I made it last night with some adjustments. Since i wanted to make enough for the family, i used about 1 can and a half of pumpkin puree. This was a pain because i had to multiply this recipe by 6. I switched out the coconut oil and used sunflower oil instead. I did this because I didn't want the pumpkin pie to taste like coconut. I put it all in a large pyrex and baked it at 350 for 55-60 min. It is delicious! It was cute and puffy, but when you take it out of the oven, it deflates. It's still good though and very light. I added ground cinnamon - really yummy! Jessica- Sorry but I am not sure on baking times. You are more than welcome to experiment though and let me know! What is the texture supposed to be like? Mine is not that cake like. Made this tonight, and it was great! Instead of pumpkin, I used some buttercup squash that I had just cooked up the other night, and it tasted so good! We ate half, and are saving the other to see what it tastes like when it's cold like pumpkin pie. :) Thanks for a great recipe! I've made this with winter squash (mostly butternut) twice now and in the oven. I used 2tbs coconut flour instead of the almond flour. Wanted to make some for everyone so I multiplied the recipe by 4, put it in a greased glass bread dish and cooked at 350 for about 20-25 minutes, nice and brown on top. Was probably drier than pumpkin pie filling but was really delicious. I'll make it again and add an extra egg for the same number of servings. BTW I mixed the squash with skins on (but no seeds) and all the ingredients in my vitamix and it was really very good! Great way to get those orange veggies in my kids. Thank you! Wow! I don't eat many desserts, but I had a massive sweet tooth after dinner tonight. This was perfect and absolutely delicious! Thank you! This was excellent, and turned out perfect! I did swap coconut flour in place of the almond flour and was very happy with the result. Thanks for sharing! This was awesome. I don't know how this would fit in a mug - I mixed it in a regular-sized bowl and it was full, so I just nuked it in that. It took 2 1/2 minutes so that it wasn't still runny in the middle. I topped it w/ chopped pecans and whipped cream, and it totally took care of my pumpkin pie craving!! This is fantastic since on the weekdays, I usually want some sweet after dinner or something and averts the crisis of going out and buying an ice cream sundae or a candy bar in a pinch. I tripled the recipe for my husband and I! Thank you! Dank(e) is German for Thank you. Just made it! IT WAS SOOO GOOOOD! Thanks for sharing! My 11-year old son and I prepared this recipe tonight. We could not believe how similar the texture was to a traditionally-baked cake. The taste was delicious too, so we made two batches. Thank you for sharing this recipe--it has convinced me to consider additional Paleo items. Making a version of these right now! Added some chocolate to make them healthy chocolate lava cakes. Can't wait for them to come out of the oven. Thanks for sharing!! If you didn't have coconut oil, what would you suggest as an alternative? By the way, Lindsay...I LOVE your recipes. I made the chocolate paleo a few days ago and we loved it! My Gluten-free and prediabetic husband and I thank you! Delicious! We don't really do the pumpkin pie thing in Australia like the Americans do but I *love* pumpkin so was super excited when I saw this. I have recently become addicted to the flaxseed meal mug muffin recipe I found on FastPaleo.com so knew I was going to love this. Once I googled how to make pumpkin pie spice I was set! Took 3 minutes in my microwave because it was still very soft on top and I was worried it wouldn't be cooked through but OMG - it was like pumpkin heaven in my mouth and will definitely be a regular. Just like the mug muffins I normally make I split the mix between two mugs and it worked perfectly. I made this today! So yummy I love the treat in a mug thing! I did not have any pumpkin puree but I cooked 1/2 sweet potato and added that to the mixture. Instead of coconut oil I used avocado oil. So I just made this delicious recipe. As one of the other posted commented my batter was also too much for a mug or small ramekin. I ended up using a 5" ramekin. After 2 mins in the micro it smelled great but was still super "wet" looking. I ended up cooking 2 more mins! It came out still looking quite gooey but the taste awesome. Is it normal that the texture of mine was still sticky and gooey? Almost like the consistency of a real pumpkin pie filling. Any feedback would be great...Thanks!!! I just made this and it was delicious!! Thank you for posting. I doubled everything, thinking I would need to, in order to feed my hubby and I, but your measurements are more than enough for 2. Unknown above, It also looked super gooey and because I'm paranoid about eggs I ended up cooking it for a total of 5 min or so. I topped with mini chocolate chips and it was perfect! Jen - Thanks for the feedback! It's nice to know it's not just me. Also, I'm right there with you regarding the eggs. Can't wait to make this again and I'll have to add the mini chips. I LOVE this recipe! I've made it numerous times and it is nomness! Sometimes I've put a cream cheese frosting on it to make it a bit more decadent (not that it needs it but I'm a lush) Anyhoo thanks for sharing! I agree with your husband, Dank!!! so yummy!!!!! I used the coconut flour, and didn't have pumpkin puree so just roasted one in the oven and used that...and didn't have honey so had to use maple syrup....and still sooo good!!!! will be making this one again...has more of bread texture maybe becuase of using coconut. The can of pumpkin that had been in my cupboard for months just screamed to me. I blended it with a can of coconut milk, 2 eggs, a lot of pumpkin pie spice and vanilla, and two dates. I poured some in a cup and nuked it for about 1 1/2 minutes. It was pumpkin mousse and my craving is gone. I have some of the uncooked combo left, so I'll try adding your other ingredients and see what happens. But not tonight - I'm all pumpkined out! I've never done this cake/mousse in a cup thing before...this could be dangerous. Any idea how to make this without eggs? I found out I have an egg allergy recently and trying to figure out to adjust receipes. Maybe substituting egg with a banana? Any ideas much appreciated! Just found this on Pinterest! I'm so excited to try it out! Found this on Pinterest today, just made it subbing egg white & stevia and it was DELICIOUS. Thanks! Will have to pick up some organic pumpkin today to try this out tomorrow night. Gave the last of my frozen puree to my canine fella. He loves pumpkin mixed with his food. Take a can of full fat coconut milk and put it in the fridge and let completely chill. Take out and pour out the water, take remainder and stir together with 1 tsp vanilla and a 2 tbls raw honey or 100% maple syrup, voila! it's creamy and fluffy and delish and takes about 2 minutes. I just made this and it's absolutely perfect! Thanks for sharing your wonderful recipes. And thanks to davey for sharing the whipped cream recipe too! I had to run off and try this since I was pms-ing and trying to eat clean and healthy! Very good, came out great! Wowza! I found your blog last night (a friend of mine mentioned it) and I just got home and had to make this. I used maple in place of honey just because I like it with pumpkin. It is amazing! I cooked it for 3 minutes in a large mug and it's awesome. Thinking of making another to try it cold tomorrow for breakfast. I love healthy desserts! Hoping my daughter will like it too. Love sneaking veggies in. Just to update... I made it again last night and had it cold for breakfast. I liked it even better! I made this in one of those oversized mugs and had to cook it for nearly 4 min as my microwave is old, but this is delicious! Love it! This....was seriously yummy. I ate it warm with just a drizzle of coconut cream. Next time, I'll chill it and eat it cold. Thanks for the recipe! This was delicious! I have made it at least six times. Kept me sane during our paleo challenge! Thank you! Delicious :) Happy I found your blog! It was good but not sweet enough for me :P I think..I might just add a whip cream topping >.< defeats the purpose of it being healthy haha, or just put in 2 tbs next time. This is amazing, as usual! I made it (for breakfast haha) in a small mixing bowl and had to cook for about 5min. Delish! My son and I just made it again today to share as a treat, adding some dark chocolate chips- way too good! Does anyone know if you can use flax egg instead of real egg to make it vegan? This recipe looks great, how many grams is 1/2 cup pumpkin puree? I found on the web it to be about 110-120g, is this the amount you use for this recipe because it seems quite a lot for only 3 tbsp almond flour? Any advice would be much appreciated! Just made it, and DAMN it's good. Danke shoen (pronounced donka shayne) is German for "Big thank you!" So, even if your husband and others who say Dank, don't speak German, they may have picked up the general idea. ... Your pumpkin pie looks great, we will try it! Can these microwave mug cakes be made without the egg :/ I don't do so well with eggs. Just tried it with squash puree, doubled the spice to add more flavor, and used 2 tbls of coconut flour instead of almond. DELISH! I made this, subbing 1 Tbsp. Pumpkin Seed protein Powder for 1 of the tablespoons of almond flour. Also used agave nectar as my sweetener. I divided into 2 ramekins. Still did 2 minutes in microwave. Totally delicious, rich, moist, and satisfying, thanks so much! This is my first visit to the blog. You are a genius. I especially like your microwave comment. U r so right. Thanks for the sweets and the smile. Oh, this is SOOOOO good. Could definitely be dangerous. I'll make it for my dad too since he loves pumpkin pie. I used maple syrup (2 Tbls) instead of honey, & unsalted butter instead of coconut oil. Stirred mix again after 1 min in MW. Took total of 2 1/2 min. The hardest part.... Waiting for it to cool enough to eat! This is a keeper! Wow! Eating this right now and it is sooooo good! Please give calories count on this recipe. This is soooooooo delicious! Thank you!